Glen Campbell died last week at the age of 81, which prompted me to watch the documentary Glen Campbell: I’ll Be Me, a 2014 film I’d been meaning to see for a while. Depending on your age or affinity for the kind of music he recorded (country, or what he humorously called “crock,” a cross between country, pop & rock) you might not realize what a legend he was in the music industry, or how beloved he was by so many musicians–the superstars and the not-as-famous–or the COURAGE he displayed in the final chapter of his remarkable life, when he went on a lengthy Goodbye Tour, knowing he had Alzheimer’s. You might be wondering, did he even know he had Alzheimer’s when he agreed to the tour? It’s a fair question given how debilitating the disease is, how it robs people of their memory and an ability to think clearly. When he first visited the Mayo Clinic in 2011 with his wife Kim, the cameras were rolling. And it’s downright painful watching him try to remember the 4 simple words the doctor asks him to repeat. Nor can he recall the year he was born, the first President of the U.S., or what year it is now. “No. I have no use for it now,” Glen says, but quips, “I can play guitar.” It’s a relief to see his sense of humor hasn’t disappeared into the fog of his brain, but it’s also heart-wrenching to watch his face react to the news he has Alzheimer’s. But heck, the man has just finished recording a new album, Ghost on the Canvas. What’s a country boy to do? With the support of his family and friends, which included wife Kim and their 3 very musical grown kids, Glen decided to go on one last tour beginning in 2012 and do it for as long as he could. And, they all decided to make a movie about it. Sounds like a train wreck waiting around the first bend, right? At the end of a performance in Napa, CA, they decided the shows couldn’t continue–but by then, Glen and his touring band had played 151 different gigs. And not just any gigs. Carnegie Hall, outdoor amphitheaters, the Library of Congress. When Glen stumbled or forgot his words, guess what the audience did? They stood up and sang the words. They lifted him up at his most vulnerable, said his friend & the film’s director James Keach. When I was a girl, I had a bit of a crush on Glen Campbell. He had a fun show Glen Campbell’s Goodtime Hour, plus he was handsome and I liked the way he sang. I lived in the northeast then, not Texas as I do now, and my crush went the way of most crushes. I fell for other “cooler” artists. My college tastes drifted towards rock and jazz and the blues. Lately America-the-Beautiful doesn’t seem so beautiful (last weekend’s White Supremacist gathering in Charlottesville? 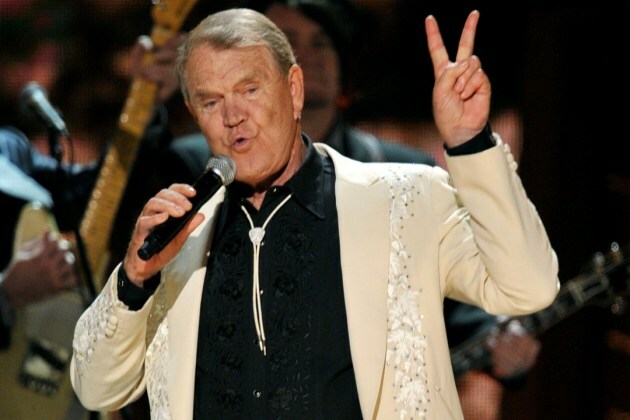 ), which is one reason why, today, I wanted to write about Glen Campbell. He lived the American Dream until the end of his life, when he lived an American nightmare, but even then he found the grace to do something beautiful. How does a kid with 11 brothers and sisters, born to sharecropper parents during the Depression in a town nobody ever heard of (Billstown, Arkansas), grow up to sell more than 45 million records, fill in for Brian Wilson during part of a Beach Boys tour, star opposite John Wayne in the first True Grit movie, win multiple Grammy and other awards, and land in the Country Music Hall of Fame? When he was four, an uncle bought him a Sears & Roebuck guitar. The film will tell you everything else and then some: his four marriages, his eight children, his bout with alcohol and cocaine, his deep religious faith. It will also show you Alzheimer’s at work. And tell you why early diagnosis is important: there are a few drugs that can slow the onset of the worst symptoms. What Glen Campbell has done to shine a light on Alzheimer’s and the need for research money to find a cure may be his greatest achievement. This, in a lifetime that was full of glittering achievements. That’s what a number of politicians have said. In the film, there’s a segment called Mr. Campbell Goes to Washington. Glen does go and sit beside daughter Ashley as she testifies before Congress about what it’s like to perform with a father who can’t remember her name–and eventually won’t remember her at all. As the Baby Boomers continue to age and get Alzheimer’s, staggering amounts of money will be needed to pay for their treatment–much of it from Medicare. Government funding for research towards a cure is very limited compared to the size of the problem. The pharmaceutical companies don’t have the money to tackle the problem on their own. This is something explained in the film, but where there’s a will, there’s a way. None of us want to grow old with Alzheimer’s, nor do we want to burden our children or society. Glen Campbell: I’ll Be Me will make you cry, but it will also give you hope. It takes vision to make a film like Dunkirk. First and foremost, it’s a film about war–the early stages of WWII–and war has millions of moving components: soldiers, weapons, ammunition, tanks, warships, planes. 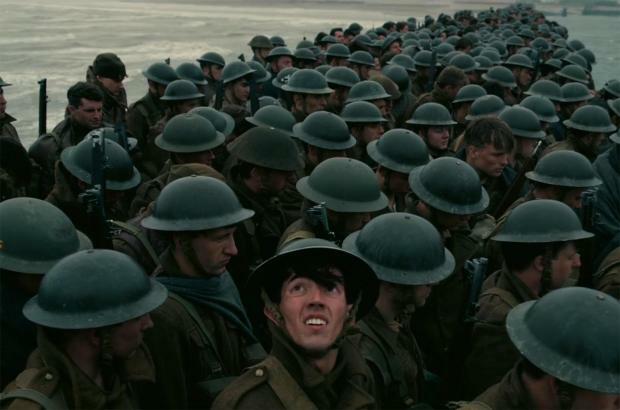 Another key factor of war is Geography, and writer-director Christopher Nolan had his hands full grappling with the logistics of portraying 400,000 troops stranded on a beach in France as the Germans close in for the kill. Christopher Nolan is a Brit. It’s important to note he was born and educated in England, even though he made his name in Hollywood and enjoys dual citizenship thanks to his American mother. Every school child in Great Britain knows the significance of Dunkirk. Operation Dynamo, as the Dunkirk evacuation was called, was the starting point–the first brushstroke on a massive painting depicting Good vs. Evil. Soldiers stranded in Dunkirk did in fact die or get left behind, but more than 338,000 men made it across the English Channel to safety, thanks to the armada of “little ships” that came to their rescue–many of them owned and manned by ordinary English citizens. England and France had declared war on Nazi Germany the previous fall, following the surprise invasion of Poland. Operation Dynamo began on May 26, 1940, and concluded June 4th, when the last of the 700+ ships made it across the water to England. Prime Minister Winston Churchill called it “a miracle of deliverance.” Churchill went on to say, “Wars are not won on evacuations.” Buoyed by the success of Dunkirk, Great Britain regrouped. The machinery of war they’d lost at Dunkirk was replaced. When the Germans attacked England by air the following month, the Brits were prepared. No man is an island, even if his country is. The Battle of Britain lasted for three months, and the Brits won that battle, which meant the country didn’t fall to Nazi Germany (as France did, weeks after Dunkirk). The British lived to fight another day, and another, and another–and work on enlisting help from the Americans. As an American, I learned about Dunkirk in school, but I remember it as a short paragraph that became fuzzy over time. Heading into the movie was the first time I began to wonder about the name. Dunkirk? It doesn’t sound French at all. You may already know the answer, but it took me decades to learn that Dunkirk is the English spelling. Dunkerque is the name of the port city in France where those 400,000 soldiers were stranded. A majority of them were British; a good many were French; others were from neighboring countries or beyond. The English claimed it–that patch of foreign soil was embedded with their blood, sweat and ingenuity. I imagine that’s how Dunkerque became Dunkirk in the collective consciousness. It strikes me that we Americans have just experienced our own “Dunkirk Spirit” moment. Last week the Senate voted in three different ways to repeal our existing healthcare act. All were defeated–and not because our healthcare system isn’t flawed. It’s because too many millions of people would have lost insurance coverage. Americans banded together and showed up at town hall meetings, legislators’ offices and in Washington; they wrote their Senators and Congressmen; and some brave women and men in the Senate–most notably John McCain, just out of surgery and diagnosed with brain cancer–stood apart from their colleagues and said, no, this isn’t right. Now, finally, Congress says it wants to approach healthcare together–not as two separate and warring parties. After experiencing Christopher Nolan’s remarkable film, I’ve joined the ranks of ordinary people–albeit on the other side of the Atlantic–who will never forget the name Dunkirk or what it stands for. Helping other people. Digging deeper for courage. Keeping my eye on the Big Picture.